Richard was a biology super star at his school. He was the top student in the Biology Olympiad since the 9th grade at his school and recently qualified as a USABO finalist. He had attended a Catholic boarding school on the East Coast since the 6th grade and had been able to maintain a cumulative GPA of 3.85 (unweighted). He was great a taking tests and had a super score of 2280 (out of 2400) on his SAT I as well as a 10 on his most recent AIME. As far as his numbers were concerned, he was doing great and we told him to stop taking tests. Apart from the Olympiad, however, his activities were quite lacking. Working with him during the summer after his 10th grade, we decided to augment his theme related activity list, but we had to be realistic about his time management. Richard’s greatest challenge would prove to be sacrificing his beloved sports-related activities. His Mentor and his parents persuaded him to take out one of his three seasonal sports activities and stop all outside activities, e.g. ultimate Frisbee. Instead, we helped him start a WordPress blog about the biotechnology industry in general so that he could learn about this exciting field that he had interest in. Then, after spending the summer doing research on Computational Biology and biotech in general, Richard had enough knowledge to start a Computational Biology club where he could share news stories about cutting edge technologies in biotech. In his blog, we were able to also help him learn how to use MATLAB and code his own computational models. He was then able to take this information and share it with his club members. After learning a lot about Comp Bio and MATLAB, we decided to start a more specific research project and then write a research paper on it. Although the prospect of writing a college level research paper was daunting at first, we guided him step by step: topic brainstorming, research / finding credible sources, writing the paper, organizing the paper, editing the paper, writing the MATLAB code, and formatting the paper appropriately. The hard work paid off when Richard received an email saying that he had been accepted to The Center for Complexity Theory, an academic journal for secondary students that focuses on complexity theory. In the end, Richard’s hard work and sacrifice gained him acceptance to both Stanford and Caltech. He is graduating from Stanford this spring and joining Stanford’s bioengineering department as a graduate student. We spend a lot of time talking about the futures of bright students with their parents. When it comes to the biological or medical fields, it seems most parents automatically default to either pre-med, pre-dentistry, or pre-vet. It’s as if they’re visiting New York City and doing the usual mundane tour: visiting the Empire State Building and missing out on all the wonderful galleries, restaurants, cafés that make NYC so interestingtoday. At IvyZen, it’s become a habit of ours to talk about computational biology every chance we get. Doing biology on a computer, rather than at a lab, is the future of science, happening right now. As Science Fiction gadgetry quickly comes to fruition, powers to quantify the natural world have become powerful. With this development, new opportunities have emerged for individuals who can handle the intellectual diversities of these new, world-wide problems. For example, human (and other species) genome projects have created a need for computer, statistical and mathematical methods of storing, retrieving and analyzing massive data sets. Similar-sized data sets have and are continuing to arise in epidemiology, mass spectrometry, and biomedical imaging. These technologies are transforming biological research. Such changes demand application of new theories and advanced computational tools to interpret data implications and create methods of controlling and modifying biological functions. Out of this need has sprung a new field of study at the crossroads of mathematical computation and biology. Once, doctors and field scientists needed merely an understanding of the natural sciences; however, these occupations now require individuals with strong backgrounds in mathematics and computers as well. Computational Biology as a general field and college major has emerged in response to this new need. The discipline is highly mathematical and generally dependent upon areas which require sophisticated quantitative analysis. The major is currently most valuable in research and applies to areas such as genetics, ecology, molecular modeling, structural biology, evolutionary biology, neurobiology, and systems biology. Technological developments in these areas frequently present novel and outstanding computational dilemmas. Computational biologists are currently working to solve many of these dilemmas, such as mapping the genetics of disease susceptibility. They are also comparing entire genomes to uncover the evolutionary history of life. They study the genetic basis of quantitative phenotypic variation, genomic plasticity and mechanisms of phenotypic adaptation. They use computational models to help predict the structure, motions, and interactions of proteins and model the complex signaling mechanisms within cells to assist in designing new therapeutic drugs. Computational biologists, likewise, predict ecosystem responses to climate change and design recovery plans for endangered species. These are just a few of the comprehensive projects faced by experts in the industry today. The future undoubtedly holds more quandaries as new information is uncovered. The complexity of problems faced by computational biologists and the urgency under which they work requires individuals entering the field to have a vast knowledge of many advanced subjects. Currently, only a handful of schools offer programs specific to computational biology, but these offerings prepare students well for both for graduate work and employment in the industry. Students best-suited for the field need a strong multidisciplinary foundation and a passion for research. Skills required for computational biology majors include: mathematics, statistics, machine learning and the physical sciences, as well as biology. Students should likewise have a strong interest in systems-level approaches to understanding molecular, cellular, and organismal behavior. Students within computational biology programs are frequently required to enroll in multiple high-level physical and mathematical sciences in order to bridge the gap between biology and computation. Those desiring to study computational biology at an institution without a predetermined program should do similarly: take as many advanced courses in computer science, mathematics, and biology as possible. While the course load may seem isolated to these topics, the nature of this degree at many universities allows flexibility for emphasis in students’ areas of interest once mastery of these fields has been attained. Such studies offer the best preparation for the range of real-world tasks computational biologists can expect to face in the next few years. As the field is relatively new, however, current coursework may not be sufficient for the problems of the next generation. The crossover-field will continually evolve as technology continues to advance. Thus, exceptional students are needed for leadership in this endeavor. Individuals with wide discipline mastery and the strong research passions will possess the skills necessary to navigate unforeseeable issues and lead mankind through the problems of tomorrow. For more success stories, tips and guidance on creating your student’s own unique and compelling theme sign up now for our downloadable booklet, Success Stories, featuring 6 Ivy League success stories about students who got into Columbia, MIT, Caltech, Dartmouth and more. 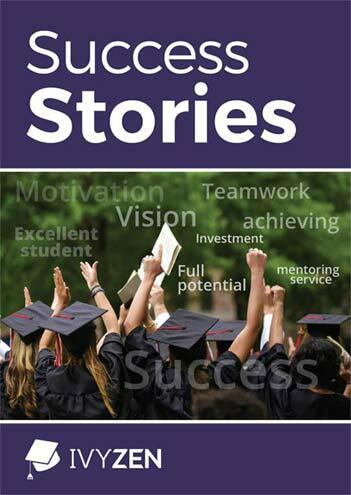 Success Stories offers an intimate look at these students’ success stories as well as a detailed look at their profile. See what activities and programs helped them get into the schools of their choice.